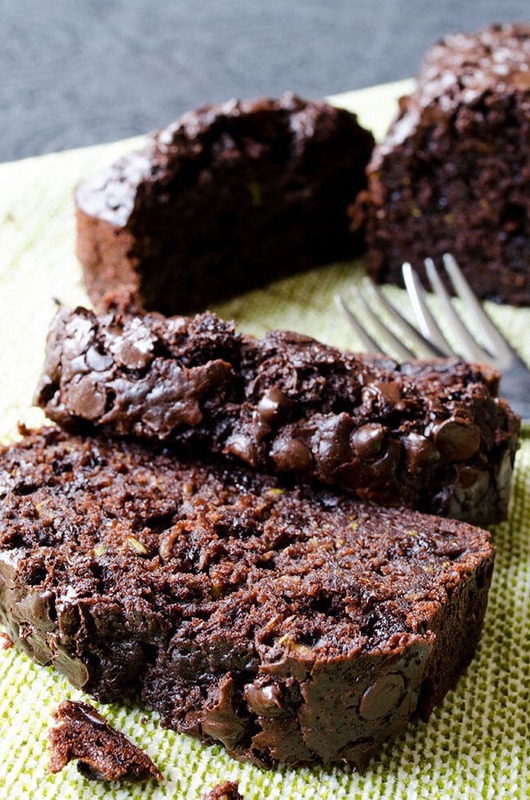 This Yogurt Chocolate Zucchini Bread is so moist and rich that I could even call them zucchini brownies in a loaf shape. Do you hear me zucchini haters? This bread will make you love zucchini! I’m pretty sure that you will be making this bread quite often and regret those years when you used to refuse eating zucchini. Video included in the post! You should try this recipe before zucchini season ends. I know you can still find zucchini in winter, but they are not good enough and you will probably end up with a less moist or even a dry bread. Also, I don’t think winter zucchini has even the half of the vitamins summer zucchini does. 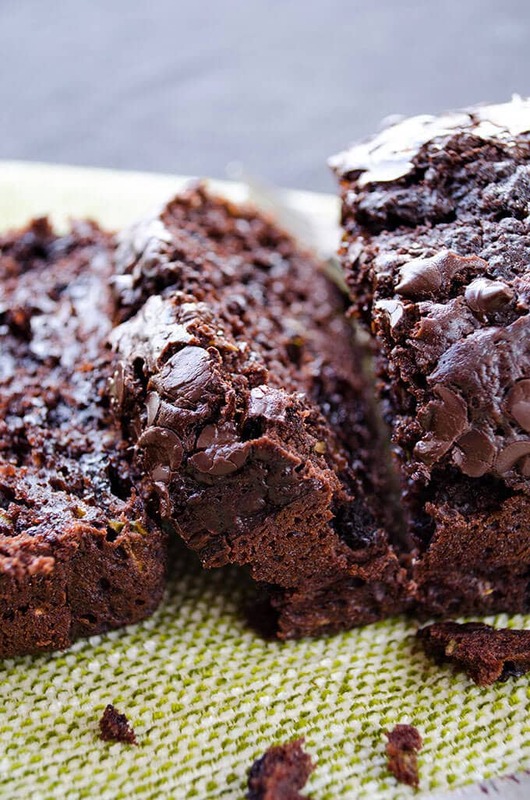 Why is this chocolate zucchini bread so good? 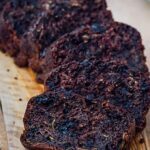 The best thing about this bread for chocolate lovers is that it’s almost guilt-free because it is made with yogurt, which helps the moistness and a little olive oil. 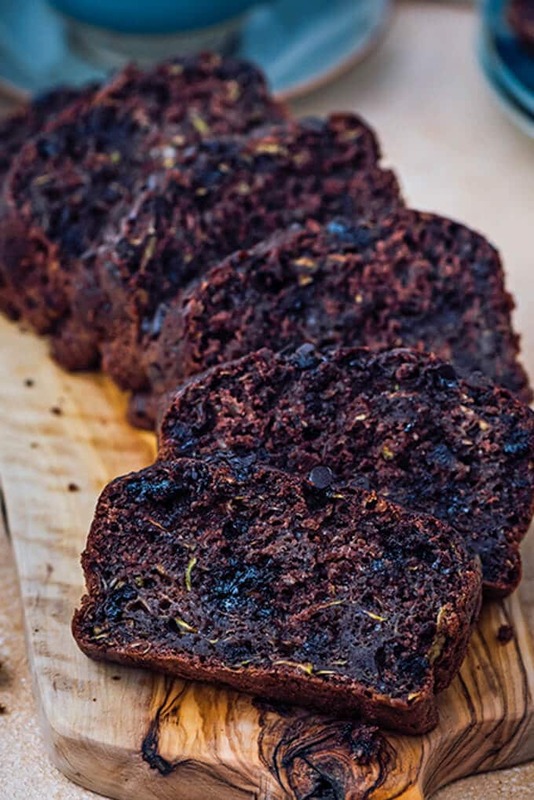 I used plain yogurt in this recipe and I didn’t have to add much olive oil, which is another great thing about this Chocolate zucchini bread. I wonder how it would be if I had used Homemade Greek Yogurt and no oil at all to make it even healthier. Will be trying this soon! Please share the result with me if you try earlier. What’s more, it contains LOTS of shredded zucchini. It is the secret ingredient which makes the bread wonderfully moist. 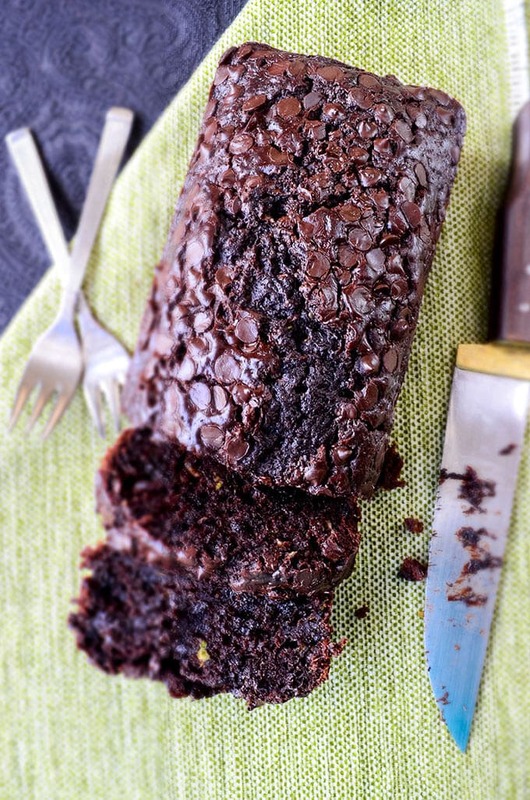 You end up with a super yummy chocolate bread packed with zucchini, which doesn’t taste in the bread at all. Can you imagine that? My first try with chocolate and zucchini combination when I made was a simple Chocolate and Zucchini Cake was a great success. It is already one of our favorites. 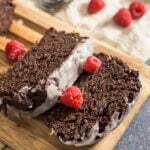 I remember how my friends were amazed when they learnt that the chocolate cake they were enjoying had a lot of zucchini. The best thing they loved was that the cake was so light. 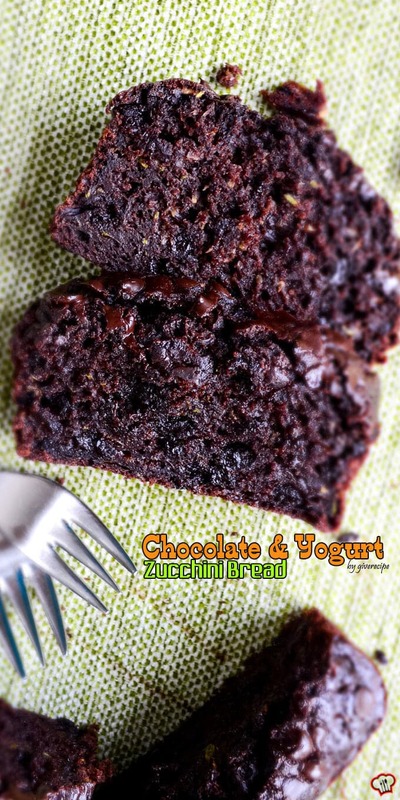 I’m sure they would love my new chocolate zucchini bread recipe with yogurt too, maybe even more because this one is moister with more zucchini, yet without any zucchini flavor. How to prepare zucchini for this bread? As you can see in the video below, we don’t need to peel the zucchinis. Just use them with their skin on, they cook through in the oven. What’s more, those tiny green pieces make a nice texture inside the bread when it is sliced. Use a big hole cheese grater to grate the zucchinis. If you use a small one, you will end up with a pile of watery zucchini and it will effect the baking of your bread even if you squeeze it. Grate the zucchinis on a piece of paper towel and then squeeze lightly in your hands. Don’t try to remove all the juice. The zucchini shreds should still be moist so that the bread is perfectly moist when baked. Watch the video below to see how I do this step. If you love your chocolate bread very chocolaty, then use chocolate chips in this bread just like I did. You can never have enough chocolate, right? Don’t forget to top your bread with extra chocolate chips before baking! It will have a sublime tempting look with chocolate chips. These ingredients make two loaves of chocolate zucchini bread and my humble suggestion is that you should take one of the loaves to your neighbour because believe me the tempting smell of this bread will even reach next door. Another suggestion could be giving one of them to a friend who hates zucchini and don’t tell him the secret ingredient until he finishes the loaf! After receiving several questions, I think it would be better to make some points more clear. Some readers had doubts about the amount of flour. They think it should be more. Well, my cup size is 250ml and the amount of flour in this recipe is definitely enough. If you add more, your bread will not be that moist. I sometimes bake it in one loaf pan and 6 muffin liners instead of using two loaf pans. The size of my loaf pan is 20x10x6cm (8x4x2 1/2 inches). Some readers had trouble with the amount of grated zucchini. Could that be because they measure the zucchini before squeezing? You should grate and squeeze and then measure it to 3 cups. Don’t try to squeeze all the juice though, just squeeze it in your hands in batches. Hope these help you to have a great result from my recipe. Need a gluten-free version? Check the following recipe out! You might just need to add a little cocoa powder more chocolate flavor. 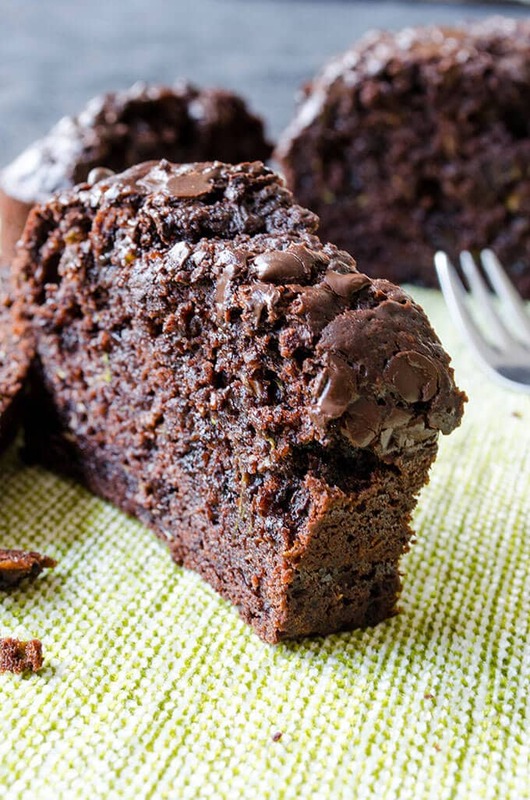 Very moist chocolate bread loaded with zucchini. Noone can tell there is zucchini inside. Preheat oven to 350F (180C). Grease 2 loaf pans (8 x4 inches) and set aside. In a large bowl, beat eggs and sugar. Add in olive oil, yogurt and vanilla extract. Mix well. Add in cocoa and mix with a spatula. Mix flour, salt, and baking powder in a bowl and sift into the egg wet mixture. Stir until smooth, but don’t overdo it. Add in grated zucchini and stir just until it is coated with the batter. Put 1 cup chocolate chips into a medium bowl. Sprinkle a little flour over them, stir and fold in the batter. Don’t overmix it. Share the batter into the pans. Top each with extra chocolate chips and bake for 60-65 minutes or until a toothpick inserted into the centre comes out slightly moist and with tiny pieces around. Let it cool completely before slicing and serving. My cup size is 250ml and the amount of flour in this recipe is definitely enough. If you add more, your bread will not be that moist. The size of my loaf pan is 20x10x6cm (8x4x2 1/2 inches). I sometimes bake it in one loaf pan and 6 muffin liners instead of using two loaf pans. You should grate and squeeze zucchinis and before measuring it to 3 cups. Don’t try to squeeze all the juice though. Just squeezing it with hands in batches is enough. This post was originally published in 2016 and has been updated with new pictures and additional information. Glad you loved it Anjela! One of our summer favorites. I just died this recipe and I think the bake time must be screwed up. I baked my two loaf pans for an hour and a half and they were still not cooked. I thought for sure an extra thirty minutes would have been enough, but nope. They all fell, even though my knife came out clean in all of them, they still fell and now will be going into the garbage. Thanks for sharing your terrible recipe. Oh…and I did try a little of the cooked outside, the taste was terrible too. Too bitter from the cocoa and not sweet enough. very good. I did 2 pans but could have used one. It also only took 50 minutes to bake but that was probably because my loaves were thin. Thanks Carol! I guess the depth of our pans are different. As for the baking time, you know ovens might be different and it’s a matter of some experience when it comes to baking. Thanks for sharing your experience, it might help others too.